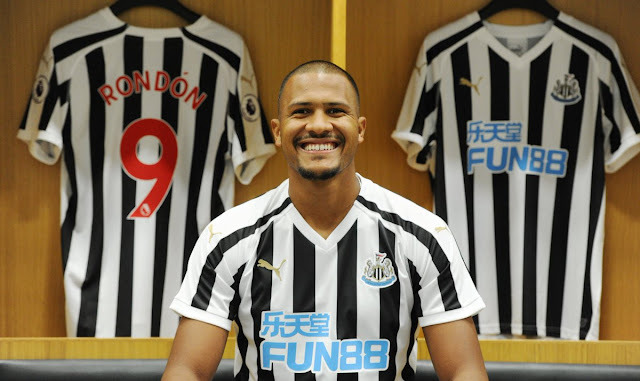 Newcastle United have announced the signing of Salomon Rondon from West Bromwich Albion on a season-long loan. As part of the deal to secure Rafa Benítez's number one transfer target, Dwight Gayle moves in the opposite direction and will remain on loan with the Baggies for their 2018/19 Championship campaign. Gayle scored 23 times during the Magpies' 2016/17 Championship-winning season but found goals much harder to come by in the following Premier League campaign, netting on six occasions. Rondón, a Venezuelan international, becomes the club's sixth summer signing. He joins fellow summer arrivals Martin Dúbravka, Kenedy, Ki Sung-yueng, Fabian Schär and Yoshinori Mutō as the club further strengthens Rafa Benítez’s squad, which finished tenth last season. Rondón said: "It's an honour to be here and I'm excited to get started with my team mates. "The clubs were talking for a long time and now I'm focused on the season to help my team mates to get the points to do well this season.